Ground Penetrating Radar Systems was contacted by Villalobos concrete in Denver, CO. The concrete scanning investigation was requested to locate rebar dowel baskets. 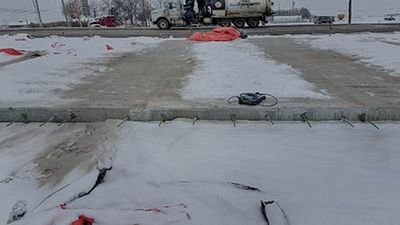 CDOT has added a MIT Scan to be done on every project when dowel bars are placed. This job was located just north of Greeley. The end goal is to verify any shifting or movement of dowel basket while concrete was poured. GPRS was able to mobilize and scan the requested area in a timely manner. GPRS used a GSSI 1600 MHz. Antenna to scan the concrete at the requested seams. Ground penetrating radar has the ability to locate reinforcement depth and placement. The target GPRS was mobilized to locate was 18” long and 1” in diameter. Typically CDOT requires a MIT Scan to be performed our customer was looking for different technology to get better results. The MIT Scan would not be able to determine between the wire baskets and rebar dowels, this caused issues when interpreting data. 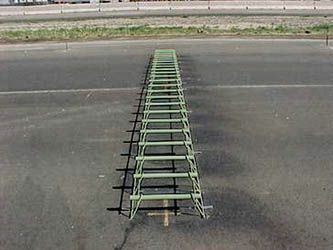 Ground Penetrating Radar is able to use sonar technology to accurately locate any shift of dowel basket without the interference of mistaking wire for rebar dowels. GPRS was able to mark all our findings precisely of this concrete scan in the field with crayon for a no mess clean up to finished product. Ground Penetrating Radar Systems, LLC. was also able to provide a in depth report of all our findings. This report consist of depth to all reinforcement on both north and south of scan. The scans were collected 8” north and south of the seam to determine the presence of rebar in each slab. This concrete scanning investigation was successful in providing CDOT, SEMA and Villalobos Concrete all the information needed to determine if a dowel basket needed to be removed and replaced. Ground Penetrating Radar Systems, LLC. is contacted daily to help other companies like this to locate post tension cables, voids, electrical conduit. GPRS helps other trades such as general contractors, pipeline projects, windfarm projects, electrical contractors and plumbing contractors nationwide to avoid injuries or expensive downtimes. GPRS specializes in finding hazardous targets prior to any excavations or soil borings. GPRS performs Concrete Scanning investigations, structural investigations, and concrete Void Mapping all over Colorado and Wyoming.